Choosing the details for your wedding day can be incredibly stressful, especially once you’ve chosen a theme. Every little detail counts for something, so you need to make each decision carefully. In an autumn wedding, you can make a difference with your centerpieces and bouquets. Florists can help you with both of these details. Employing more than 90,427 people and generating $7 billion in annual revenue, the American florist industry is huge, and you’re sure to find someone who can help. Check out our top three ways you can make the most of an autumn wedding! 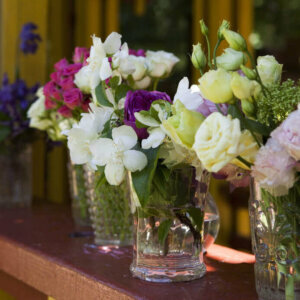 Wedding flowers are very central in tying together outfits, themes, etc. in a wedding. So why not opt for autumn inspired wedding bouquets? It’s a small but important detail that can aid in tying everything together. Plus, it goes well with the season that you’re getting married in! This isn’t to say that you can’t incorporate traditional flowers like the Madonna Lily — which is one of the oldest lilies at over 3,000 years old — but you can strike an adorable balance here. Flowers aren’t the only thing that can be used to tie things together. With your centerpieces you can be even more creative. Incorporate fall inspired items like mini pumpkins and gourds, acorns, pinecones, and foliage. A wedding florist can help you come up with something that can use signs of the season to create masterpieces! There are more ways to celebrate the season than by simply throwing in the traditional fall foliage colors and typical seasonal items. For example, there are lesser known items and colors you can use to stick with a fall theme without falling into clichés. Plum, amber, champagne, beige and other darker colors can also convey seasonal colors. You can also use harvest themed items in your decorations, in addition to the more traditional fall foliage decor. Will you be using any of these ideas? Which ones are your favorites? Did we miss something that you would do with a fall wedding?